James Thomas Geffert 88 of Ridgewood NJ and Bartonsville PA, passed away Wednesday May 30, 2018, after a battle with heart disease. He leaves his beloved wife of 61 years, Dorothy. Born and raised in Hazleton, Pennsylvania, he was the son of Andrew Geffert and Anna Geffert. James worked with his brother Thomas during summers in the Pocono Mountains while attending Penn State University. 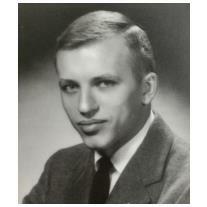 At Penn State he was the Editor of the 1952 La Vie yearbook and was involved in many other campus activities and a member of The Who’s Who in American Colleges and Universities organization. Upon graduation he immediately enlisted in the Army’s Third Armored Division and after training at Ft. Knox he served in Europe. He retained a lifelong interest in Military history. Upon returning from military service, James worked in New York City where he had a long career as a Madison Avenue Advertising Executive. He was an avid golfer and skier and once battled back from a near fatal skiing injury and a second accident that easily could have been. He was a passionate NY Giants, NY Rangers and NY Yankees fan. He enjoyed reading, travel, weekends in the Pocono Mountains and when not busy, he pursued artwork and painting. A man of many passions, he cared most for his family. Surviving are his four sons: James and his wife Aurora, Robert and Howard, W Scott and his wife Rita, and Peter. There are four grandchildren: Stephanie Roth, Allen, Ryan and Sawyer and his great granddaughter Calla. Also surviving is his brother Thomas and wife Anne.